“The recording process was 24-track tape and an old Trident board. And as many tubes as possible. Add y to analog and you have the analogy just described by Simmons, but that “thick sound” is more than a descriptive term for the Monster production done by Paul Stanley and Greg Collins (who were also the producers of Sonic Boom). Paul Stanley may not have the vocal range he once did, but his reaching yet never screeching deliveries fit the rock and roll profile of ‘Hell and Hallelujah’ perfectly. The band go back in time for the tongue-in-cheek, heavy caveman rock of ‘Back to the Stone Age,’ with Simmons declaring he’s “back where I belong!” (I couldn’t possibly comment, Gene) over a pounding Eric Singer beat and incessant riff. Just prior to the release of Aerosmith’s Music From Another Dimension! 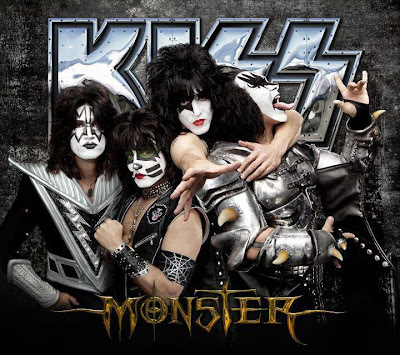 (the band’s first studio album of all new material in eleven years), Aero front man Steven Tyler made a few all make-up and no substance remarks about KISS during an interview with a Florida radio station. Those remarks met with both a shaking of the head and genuine Laugh Out Loud moments here at FabricationsHQ. said the ex-American Idol judge. Joe Perry was also interviewed and the Aero guitarist added “It’s two different animals. They went the theatrical way and used rock ‘n’ roll as their soundtrack. For Aerosmith, the music is our show. And therein lies the greatest rock and roll irony.